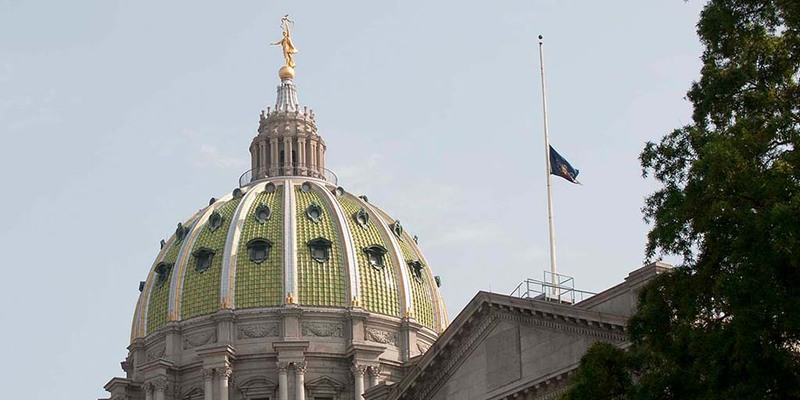 Harrisburg, PA – Governor Tom Wolf has ordered the Commonwealth flag on the Capitol Complex, at all Commonwealth facilities, and all public buildings and grounds throughout the commonwealth to fly at half-staff to honor former Senator Harris Wofford, who passed away Monday, January 21. “Frances and I send our deepest condolences to Senator Wofford’s husband, loved ones and friends. There’s no better way to describe Harris Wofford than ‘public servant.’ He dedicated his life to service and to making the world a better and more peaceful place. Senator Wofford, alone, is responsible for thousands upon thousands of Americans pursuing public service and volunteering in their communities and throughout the world. “His legacy in Pennsylvania, the United States and the world is as impressive as it is diverse: A World War II Army veteran, a civil rights hero, an adviser to both President Kennedy and Martin Luther King, Jr., a United States Senator, the president of Bryn Mawr College, and so much more. He was a tireless advocate for health care access, world peace, equal rights, and civic engagement. “I was fortunate to meet and work with then-Secretary of Labor and Industry Wofford during the Casey Administration. As a former Peace Corps volunteer, I was always an admirer of his pivotal role in launching that important program. I am grateful for the opportunity to have met him and for the lessons he taught us all. The Commonwealth flag shall be lowered until interment. All Pennsylvanians are invited to participate in this tribute.